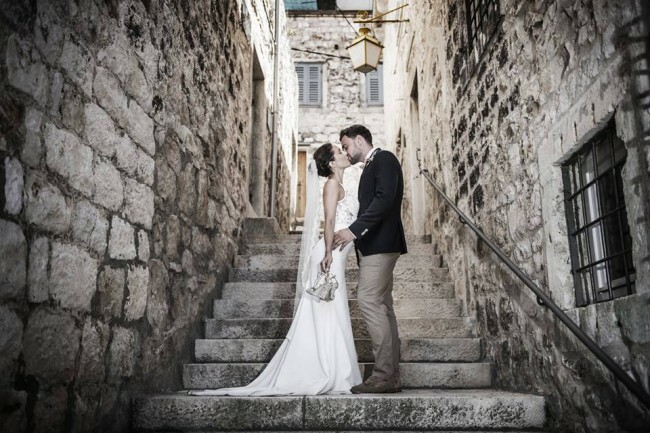 This fitted ivory AVA (Blackburn Bridal Couture) dress was worn to my summer wedding in Hvar, Croatia and I felt like a timeless movie star in it. The simple, classic cut hugged my figure in all the right places and the pretty bodice with subtle sequin and beaded bodice showed off my bust and back in a really stylish way without it being too much. The train at the back faves this dress that extra wow factor and over all I felt so beautiful in it and know whoever else wear this providing they are a size 6 or smaller will feel the same. I am also including my spanish-style antique lace, ivory veil to complete the look (as both look so lovely together!) at no extra cost. This dress has been dry cleaned and is spotless and like new after being worn once.